If you were born in the 1990s, then you must have heard of the iconic TV show, Beverly Hills 90210. The series was just filled with top brand stores, palm trees, high class parties, glamorous women, and glamorous cars! Yes, looking back on the TV show can make any fan feel nostalgic. But you'll be even more excited to hear that you can relive that nostalgia again, by playing one of iSoftBet's most loved games in casinos online, Bev Hills 90210. For many of us, we know how affluent the characters lives were in the series, where they show off their beautiful mansions, white sandy beaches, and high brand dresses in style. But in this Slot Games, you'll feel like you're actually one of the characters. Making big winnings and hitting jackpots to the point where you'd see yourself driving down the sunset boulevard in Los Angeles! iSoftBet is known to develop and publish most of the casino games that you're already playing right now, which make you want to spend hours on it, and forget all of the domestic tasks that you have to do back at home! After being certified in Spain, Italy, Portugal, Belgium, Alderney, and the UK, they've made themselves a task to make sure that each and every one of their games is easy enough for the players to manage, and exhilarating enough to keep them entertained. Whether you want to play a classical game like Cherry Trio, or a modern complex game like Forest Mania, it's certain that you will win more than what you've bet in any game created by iSoftBet. If you love promo's, get the best Slots offers. 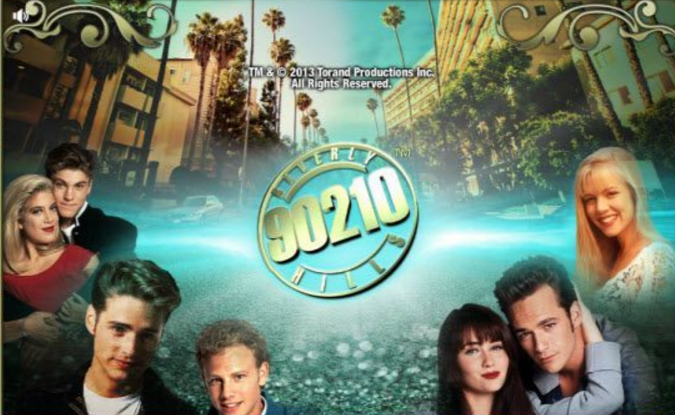 Once you load Bev Hills 90210 on your laptop, tablet, or smartphone, your ears will be filled with the original soundtrack of the series to get you buzzing. The players can make a quick bet and select their coin size at the bottom of the gameboard. ; right below the 5 reels that covers most of the screen and where it also has 243 paylines. Like with a lot of slot games, the reels are covered with a series of classic letter symbols that can make you gain winnings when aligned in a matching set. But what adds to the 90s LA theme are the iconic characters that would appear on the reels, not to mention the red sports cars and TV logos that represent the WILDS and SCATTERS. WILD Red Sports Car: Like any other WILD, the Red Sports Car replaces any other symbol you'd see on the reels apart from the SCATTER TV Logo. SCATTER TV Logo: When these 3 symbols appear, the player will receive 8 free spins and a multiplier of 5, 4 symbols equal 15 free spins and a multiplier of 15, and 5 symbols give you 25 free spins and a multiplier of 30. Now, you may be asking what are these free spins that I'd get, and how do they play out? Well, there are 2 types of free spin bonus rounds that will activate when you see the original characters having fun on the beach. Girl FREE SPIN: 5 random symbols on the reels will become WILDS on this free spin round. Boy FREE SPIN: 3 of the reels themselves will be completely covered in WILDS on this free spin round. 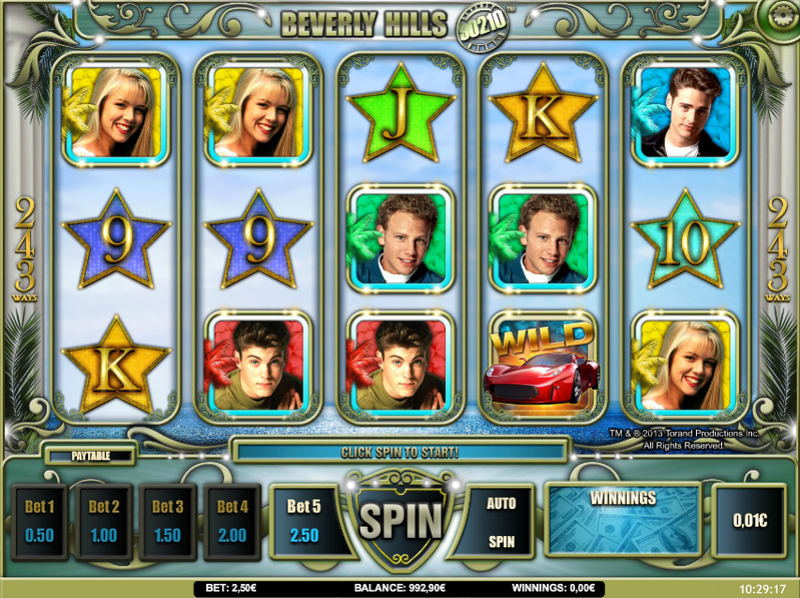 Bev Hills 90210 is pretty easy to manage when you want to place all of your bets down before you hit the spin button. The players have the option to pay from left to right, or both ways, which gives them more opportunities to land themselves with big prizes on the game. All alongside the extra features and the transformer that would appear in Bev Hills 90210. 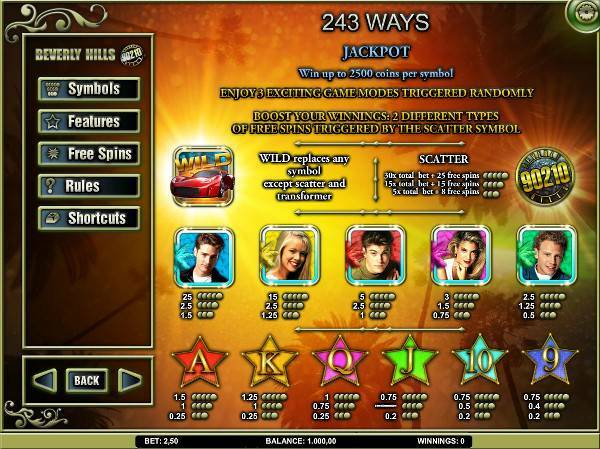 Aside from the gameplay itself, it's no wonder why it's highly rated amongst the people that play the online slot game. Fans of the show will click on the game in an instant, and slot game lovers will keep clicking on the spin button every time a round finishes or the sound of the Beverly Hills soundtrack ends. If you enjoyed Beverly Hills 90210 then you might also like Doubleup Ducks.